The alpha1 (α1) subunit of the sodium/potassium ATPase (i.e., Na+/K+-ATPase α1), the prototypical sodium pump, is expressed in each eukaryotic cell. They pump out three sodium ions in exchange for two extracellular potassium ions to establish a cellular electrochemical gradient important for firing of neuronal and cardiac action potentials. We hypothesized that myosin (myo or myh) motor proteins might interact with Na+/K+-ATPase α1 subunits in order for them to play an important role in the transport and trafficking of sodium pump. To this end immunoassays were performed to determine whether class II non-muscle myosins (i.e., NMHC-IIA/myh9, NMHC-IIB/myh10 or NMHC-IIC/myh14), myosin Va (myoVa) and myosin VI (myoVI) would interact with Na+/K+-ATPase α1 subunits. Immunoprecipitation of myh9, myh10, myh14, myoVa and myoVI from rat brain tissues led to the co-immunoprecipitation of Na+/K+-ATPase α1 subunits expressed there. Heterologous expression studies using HEK293 cells indicated that recombinant myh9, myh10, myh14 and myoVI interact with Na+/K+-ATPase α1 subunits expressed in HEK293 cells. 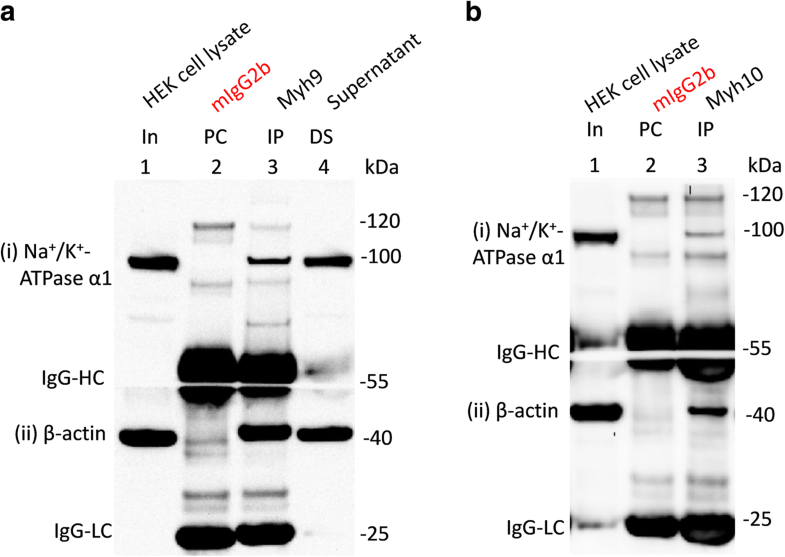 Additional results indicated that loss of tail regions in recombinant myh9, myh10, myh14 and myoVI did not affect their interaction with Na+/K+-ATPase α1 subunits. However, recombinant myh9, myh10 and myh14 mutants having reduced or no actin binding ability, as a result of loss of their actin binding sites, displayed greatly reduced or null interaction with Na+/K+-ATPase α1 subunits. These results suggested the involvement of the actin binding site, but not tail regions, of NMHC-IIs in their interaction with Na+/K+-ATPase α1 subunits. Overall these results suggest a role for these diverse myosins in the trafficking and transport of sodium pump in neuronal and non-neuronal tissues. The sodium pump (sodium/potassium ATPase; Na+/K+-ATPase) is an integral membrane protein found in the cells of all higher eukaryotes . It utilizes ATP as a driving force to pump out three sodium ions in exchange for two extracellular potassium ions which establishes both a chemical and an electrical gradient across the cell membrane. The electrical gradient is essential for maintaining cellular resting potential and excitability of myocytes (skeletal and cardiac) and neurons. The sodium gradient helps drive various transport processes such as the fluid reabsorption and translocation of glucose, amino acids, and other nutrients into the cells [1, 2]. Sodium/potassium-ATPase also function as a signaling molecule and is shown to regulate MAPK pathway, reactive oxygen species (ROS) formation as well as intracellular calcium [2–4]. It is principally composed of two subunits, an alpha-subunit (α; ≈100 kDa) and a beta-subunit (β; ≈40 kDa). The α subunit (i.e., catalytic subunit) has four isoforms: α1 (Atp1a1), α2 (Atp1a2), α3 (Atp1a3) and α4 (Atp1a4). The β subunits has four isoforms as well: β1 (Atp1b1), β2 (Atp1b2), β3 (Atp1b3) and β4 (Atp1b4). These α and β subunits admix to form a minimal functional sodium pump. The minimal functional unit of the Na+/K+-ATPase can be further modified by a third FXYD subunit (also known as gamma-subunit (γ)) . Mammals express seven FXYD proteins. Na+/K+-ATPase α1 subunits in association with its β1 subunit is found in nearly every tissue  . The α2 subunits are predominantly expressed in adipocytes, muscle, heart, and brain (i.e., mostly glial cells). The α3 subunits are abundant in nervous tissues (i.e., mostly neurons). The α4 subunits are a testis-specific isoform . Ablation of Na+/K+-ATPase α1, α2 or α3 subunits result in the death of the animal . The mechanisms by which Na+/K+-ATPase α and β subunits are trafficked to the cell surface are not well understood. Generally, vesicles carrying membrane proteins traffic from the intracellular pools to the plasma membranes. This involves their transport by kinesin family of motor proteins (KIF) along the microtubules and/or by myosin (myo or myh) family of motor proteins (myo or myh) along the actin filaments. Kinesin light chain 2 (KLC2) of kinesin-1 heavy chain (KIF5B) has been shown to be involved in the trafficking of Na+/K+-ATPase α1 subunits in alveolar epithelial cells . In the same cell types, myosin Va (myoVa), a member of the myosin family of actin-based motor proteins, is shown to be involved in the trafficking of Na+/K+-ATPase α1 subunits . Class II non-muscle myosins (NM-II), like class II muscle myosins, are hexameric molecules comprising of two heavy chains (HC), two myosin essential light chains (ELCs) and two regulatory light chains (RLCs or MRLCs). The non-muscle myosin heavy chain (NMHC) is comprised of a globular head/motor domain (the site for interaction with actin and adenosine triphosphate (ATP)); a neck region (site for interaction with ELCs and RLCs); and a tail region which homodimerizes in a helical fashion (and possibly the site for interaction with the cargo) . By contrast, myoVI is a monomeric heavy chain that consists of a head domain, a neck region (that contains converter/reverse gear domain, IQ motif/domain and site for interaction with calmodulin light chain) and a tail domain that contains a cargo-binding domain (CBD, the site for association with cargo adaptors). MyoVI moves toward the slow-growing (minus) ends of the actin filaments contrary to all other native myosins that move toward the fast-growing (plus) ends of F-actin . We hypothesized that myosins (myh or myo), particularly class II non-muscle myosins (NM-II; myh9, myh10 and myh14) and myosin VI (myoVI) in addition to myoVa, might play an important role in the trafficking of Na+/K+-ATPase α1 subunits to cell membranes. Mammalian non-muscle myosin II isoforms were aligned using ClustalO program (https://www.ebi.ac.uk/Tools/msa/clustalo/). The 3-D coordinates of human myh14 (PDB: 5I4E) was retrieved from protein data bank . Structural features of myh14 was visualized and analyzed using UCSF Chimera (http://www.cgl.ucsf.edu/chimera/). Various polyclonal (rabbit or goat) antibodies and monoclonal (mouse) antibodies used for immunoprecipitation (IP) and/or immunoblotting (IB) are provided in the supporting information section (Additional file 1: Tables S1 and S2). Antibody dilutions and/or concentrations used for IP and/or IB assays along with the molecular weight (~kDa) of the antigens detected by these antibodies are also provided (Additional file 1: Table S2). Immunoblots were incubated with monoclonal antibodies against myh9 (1:500; Abcam), myh10 (1:1000; Abcam), myosin regulatory light chain (MRLC) (1:200; Santa Cruz Biotechnology), Na+/K+-ATPase α1 (0.5 μg/mL; DSHB), Na+/K+-ATPase α1 (1:1000; EMD Millipore), Na+/K+-ATPase α (1:200; Santa Cruz Biotechnology), GFP (1:1000, NeuroMab), myosin VI (1:500; Sigma), voltage gated sodium channel α subunits (pan-Navα; 1:1000; Sigma) and β-actin (1:10000; Sigma). Polyclonal antibodies against GFP (1:2000; Abcam), mCherry (1:1000; Abcam) and myosin Va (1:500; Cell Signaling Technology) were also used for immunoblotting. Na+/K+ ATPase α antibody obtained from Santa Cruz Biotechnology (sc-58,628; clone M7-PB-E9) is considered as a pan-Na+/K+ ATPase α antibody in some quarters as it detects Na+/K+ ATPase α subunits (i.e., α1, α2 and α3) from human, mouse, sheep, dog, pig and chicken. It also detects rat Na+/K+ ATPase α3 but not rat Na+/K+ ATPase α1 or α2 subunits. The monoclonal antibody against Na+/K+ ATPase α1 (α6F) was developed by Dr. D.M. Fambrough. It was obtained from the Developmental Studies Hybridoma Bank (DSHB) and was developed under the auspices of NIHCD and maintained by the University of Iowa, Department of Biological Sciences, Iowa City, IA 52242. The MRLC antibody used in this study (sc-28,329; clone E4; SCBT) is already shown to detect various MRLCs and hence considered as a pan-MRLC in some quarters . It is claimed to recognize the MRLCs from human (i.e., MRCL3, MRLC2, MYL9 and LOC391722: myosin regulatory light chain 12B-like), mouse (i.e., Mylc2b, Myl9 and Myl12a) and rat (i.e., Mrlcb and Myl9) tissues. In our hand, it poorly detects the MRLCs from HEK293 cell lysates, but it detects the MRLCs as a co-immunoprecipitate from precipitation of NMHC-IIs very well (Additional file 2: Figure S1). Standard molecular cloning or fast cloning methods  were followed for sub-cloning. Details about the various cDNA constructs (i.e., species, isoform, amino acid length; etc.) used in this study are provided in the supporting information section (Additional file 1: Table S3). CMV-GFP-NMHC II-A (i.e., GFP-myh9), CMV-GFP-NMHC II-B (i.e., GFP-myh10) and EGFP-NMHC II-C (i.e., myh14-GFP) were gifts from Robert Adelstein (Additional file 1: Table S3) [15, 16]. Like myh14-GFP, myh9 and myh10 were sub-cloned to have GFP fused to their C-termini (i.e., myh9-GFP and myh10-GFP). The tail regions of myh9 (i.e., AAs:1928–1960), myh10 (i.e., AAs:1934–1976) and myh14 (i.e., AAs:1946–1992) were deleted to make myh9-Δatil-GFP, myh10-Δtail-GFP and myh14-Δtail-GFP constructs respectively following the work of others . The actin binding sites (ABS) of myh9 (i.e., AAs:654–676), myh10 (i.e., 661–683) and myh14 (i.e., 674–696) were also deleted to make myh9-ΔABS-GFP, myh9-ΔABS-GFP and myh9-ΔABS-GFP constructs respectively. Information about the actin binding sites and/or tail regions of NMHC-IIs were obtained from literature and/or UniProt site [17–19]. The human myosin Va (myoVa) and myosin VI (myoVI) cDNA clones were obtained from Dharmacon (Lafayette, CO, USA) (Additional file 1: Table S3). Both myoVa and myoVI were sub-cloned to have GFP fused to their C-termini (i.e., myoVa-GFP and myoVI-GFP, respectively). MyoVI was also tagged with mCherry in the N-terminus (i.e., mCherry-MyoVI). Twenty two (22), 60 and 120 AAs were deleted from the C-terminal end of mCherry-MyoVI to make mCherry-Myo6-ΔT1, mCherry-Myo6-ΔT2 and mCherry-Myo6-ΔT3 constructs respectively following the work of others . A mouse Na+/K+-ATPase α1 cDNA clone was obtained from Dharmacon (Lafayette, CO, USA). Na+/K+-ATPase α1 subunits were sub-cloned to have mCherry fused into their C-terminus (i.e., Na+/K+-ATPase α1-mCherry). The ankyrin-G-270-mCherery (i.e., AnkG270-mCherry) construct was a gift from Benedicte Dargent  (Additional file 1: Table S3). The Nav1.6 (i.e., voltage gated sodium channel alpha 6 subunit/SCN8A) construct was available in our laboratory. It harbors a mutation [Tyr371Ser] that renders it resistant to tetrodotoxin (TTX). HEK293 cells were cultured according to standard procedures and were transfected with desired cDNA constructs using Optifect (Thermo Fisher Scientific, Waltham, MA) or LipoJet™ transfection reagent (SignaGen Laboratories, Rockville, MD) according to manufacturer’s instructions. All animal care and experimental studies were approved by the Veterans Administration Connecticut Healthcare System Institutional Animal Care and Use Committee. We followed the protocols published elsewhere  with some modifications to prepare the adult rat (Sprague-Dawley) brain tissue or HEK293 cell lysates for IP and immunoblotting. The lysis or IP buffer was made of 20 mM Tris-Cl (pH 7.4), 150 mM NaCl, 1% Triton X-100, 1 mM DTT, 10 mM EGTA and 2× Complete protease inhibitor cocktail (Roche Diagnostics Corporation, Indianapolis, IN). An adult whole rat (male or female) brain was homogenized in pieces in a tissue grinder (Qiagen, Valencia, CA) to a final volume ~ 50 mL lysis buffer. Homogenates were solubilized for 2 h at 4 °C, and centrifuged at 50,000 g for 30 min at 4 °C using a Beckman Coulter Optima® ultra-centrifuge to collect the supernatants for immunoprecipitation (IP) and immunoblotting. Non-transfected HEK293 cells (control) or those transiently transfected with plasmid constructs were collected by centrifugation at 500 g for 5 min at 4 °C upon trypsinization. These pellets were washed twice with ice cold PBS by centrifugation at 500 g for 5 min at 4 °C before lysis using the IP buffer. Cell supernatants were obtained by centrifugation at 15,000 g for 20 min at 4 °C for IP and immunoblotting. Protein concentration in the tissue lysates was determined using the Bradford reagent (Bio-Rad, Hercules, CA). For IP experiment, HEK293 cell or rat brain tissue supernatants containing 1–4 mg protein (in ~ 1 mL lysate) was pre-cleared (PC) for 1–4 h at 4 °C with 5–10 μg of suitable mouse antibody isotypes, rabbit immunoglobulins or goat immunoglobulins, and 80–100 μl of Dynabead® protein G (Thermo Fisher Scientific). Precleared supernatants were incubated (overnight, 4 °C) with 5–10 μg of desired IP antibody (Additional file 1: Table S1) and 80–100 μl of Dynabead® protein G. Dynabead® Protein G beads bound to control antibody isotypes (i.e., PC complexes) or desired primary antibodies (i.e., IP complexes) were washed for 5 times with IP buffer or wash buffer supplied by the vendor (Thermo Fisher Scientific) and eluted with NuPAGE® LDS Sample Buffer (Thermo Fisher Scientific) in the presence of NuPAGE® Sample Reducing Agent (Thermo Fisher Scientific). About 30–50 μg of HEK293 cell or rat brain tissue lysates were denatured using NuPAGE® Sample Reducing Agent in the presence of NuPAGE® LDS Sample Buffer to serve as input (In) sample for western blotting. The input samples, PC complexes, IP complexes and/or at times denatured depleted supernatants (DS) were resolved on NuPAGE® Novex® 4–12% Bis-Tris Gels (1.0 mm, 12 well) and transferred to a nitrocellulose membrane. Membranes were blocked using a blocking buffer (5% non-fat dry milk and 1% BSA in 0.1% TBST or 5% BSA in 0.1% TBST) for 1 h, washed and incubated overnight with desired primary antibodies (Additional file 1: Table S2) diluted in the blocking buffer. The blots were washed and incubated in horseradish peroxidase-conjugated goat anti-mouse (1:10000; Dako, Santa Clara, CA), goat anti-rabbit (1:10000; Dako, Santa Clara, CA) or donkey anti-goat (1:5000) immunoglobulins for 1 h. The blots were washed extensively and developed for 1 to 10 min with the Perkin Elmer Western Lightning Plus-enhanced chemiluminescence (ECL) kit using a Bio-Rad ChemiDoc XRS+ or ChemiDoc Imaging System. At times immunoblots were stripped using a stripping buffer (Thermo Fisher Scientific) to re-probe with another primary antibody. We usually cut through the IgG-HC and/or IgG-LC regions of the Ponceau S (Sigma) stained nitrocellulose membranes for probing different section of the membrane with different antibodies. Therefore, cut marks could be seen in some images. Antibodies already known to be suitable for immunoprecipitation (IP) were used. Antibodies, for which such information is not available, were considered suitable for IP assays when they would precipitate their cognate antigen and/or co-immunoprecipitate a known partner protein of their cognate antigens. Hence, for myosin antibodies we evaluated their ability to immunoprecipitate their respective cognate antigens and/or co-immunoprecipitate β-actin and/or MRLCs. This is because class II myosins (such as myh9, myh10, myh14; etc.) invariably interact with actins and MRLCs (Figs. 1, 2, 3 and Additional file 2: Figure S1). First, we tested the ability of the myh9 (Abcam: ab55456) and myh10 (Abcam: ab684/3H2) antibodies to immunoprecipitate their cognate antigens and co-immunoprecipitate β-actin and/or MRLCs from HEK293 cells (Additional file 2: Figure S1). Both myh9 and myh10 antibodies immunoprecipitated their respective cognate antigens and co-immunoprecipitated β-actin and MRLCs from HEK293 cells. Myh9 appeared to co-immunoprecipitate β-actin better than myh10 from HEK293 cells which could be due to many factors  including the fact that myh10 antibodies are available as ascites and their use was determined empirically. However, both myh9 and myh10 antibodies pulled down β-actin from rat brain tissues very well (Fig. 1a ). We also assessed the ability of myh14 (a close homolog of myh9 and myh10 and the 3rd member of the class II NMHC), myoVa and myoVI to immunoprecipitate their respective cognate antigens and/or co-immunoprecipitate β-actin (Figs. 1b and 4). β-actin was co-immunoprecipitated with myh14, myoVa and myoVI to various degrees from rodent brain tissues (Fig. 1). We also observed that myoVa and myoVI antibodies would not or very poorly co-immunoprecipitate β-actin from HEK293 cells (Figs. 4 and 5). As expected the microtubule-based kinesin motor, KIF5B, did not co-immunoprecipitate β-actin from rat brain tissue lysates (Fig. 1a). We also immunoprecipitated recombinant myh9 (Fig. 6, Additional file 3: Figure S2, Additional file 4: Figure S3B, Additional file 5: Figure S4 and Additional file 6: Figure S5), myh10 (Additional file 3: Figure S2, Additional file 4: Figure S3 and Additional file 6: Figure S5), myh14 (Additional file 4: Figure S3A, Additional file 5: Figure S4 and Additional file 7: Figure S6), myoVa (Additional file 8 Figure S7) and myoVI (Additional file 9: Figure S8) expressed in HEK293 cells to determine whether they would reflect the β-actin and/or MRLC binding abilities of myosins antibodies characterized earlier. Immunoprecipitation of recombinant myh9 (GFP tag either in the N- or C-terminus), myh10 (GFP tag either in the C-terminus) and myh14 (GFP tag in the C-terminus) using anti-GFP antibodies led to the co-immunoprecipitate β-actin and/or MRLCs from HEK293 cells. Neither recombinant myoVa nor myoVI (tagged with GFP in the C-terminus) would co-immunoprecipitate β-actin from HEK293 cells. These results recaptured the findings from myosin antibody-based assays that NMHC-IIs, but not myoVa nor myoVI, co-immunoprecipitate β-actin from HEK293 cells. These results also demonstrated that the GFP antibodies are suitable for use in IP assays. The suitability of the mCherry antibodies (Abcam: ab183628) for use in IP assays was evaluated by immunoprecipitating mCherry tagged ankyrin-G (AnkG) (Additional file 10: Figure S9). Immunoprecipitation of AnkG-mCherry (i.e. AnkG tagged with mCherry in their C-terminus: AnkG270-mCherry = AnkG-mCherry) using mCherry antibodies led to the co-IP of Na+/K+-ATPase α1 subunits (a known partner of AnkG) from HEK293 cells. Also, AnkG270-mCherry, but not mCherry, IP led to the co-IP of Nav1.6 subunits (a known partner of AnkG) and Na+/K+-ATPase α1 subunits when HEK293 cells were co-expressing both AnkG270-mCherry and Nav1.6 subunits. These results also suggested that the mCherry antibodies are suitable for use in IP assays. The suitability of anti-Na+/K+-ATPase α1 antibodies for use in IP assays was evaluated by determining their ability to immunoprecipitate their cognate antigens and/or co-immunoprecipitate β-actin (as Na+/K+-ATPase α1 subunits are known to interact with β-actin) (Figs. 2 and Additional file 11: Figure S10) . As expected immunoprecipitation using Na+/K+-ATPase α1 antibodies (DSHB: a6F or Millipore: 05–369) led to the precipitation of its cognate antigens and co-IP of β-actin. Thus, all the antibodies used in IP assays appeared to suitable for such purposes. In this work we largely focus on the interaction of NMHC-IIs, myoVa and myoVI with Na+/K+-ATPase α1 subunits. It is because these myosins are well studied and heavily involved in the transport and trafficking of various cellular cargoes . Non-muscle myosin II isoforms (i.e., myh9, myh10 and myh14), myoVa and myoVI were immunoprecipitated from adult rat brain tissue lysates to ascertain the potential in vivo interaction of these myosin motors with Na+/K+-ATPase α1 subunits (Fig. 1). Sodium/potassium ATPase α1 subunits were co-immunoprecipitated with myh9, myh10, myh14, myoVa and myoVI expressed in adult rat brain tissues (Fig. 1a and b). Kinesin-1 heavy chain (KIF5B) was immunoprecipitated to control for the co-IP Na+/K+-ATPase α1 subunits. Immunoprecipitation of KIF5B led to the co-immunoprecipitation of Na+/K+-ATPase α1 subunits expressed in rat brain tissues (Fig. 1a). This was not surprising given that kinesin light chain 2 (KLC2) is involved in the movement of Na+/K+-ATPase-containing vesicles . We also investigated whether the cell background would have any effect on the interaction of NMHC-IIs, myoVa and myoVI with Na+/K+-ATPase α1 subunits. To this end we immunoprecipitated these myosins from HEK293 cells and probed for the co-immunoprecipitation Na+/K+-ATPase α1 subunits expressed there. Na+/K+-ATPase α1 subunits were co-immunoprecipitated with myh9, myh10, myh14 and myoVI expressed in HEK293 cells (Figs. 3 and 4). However, myoVa did not co-immunoprecipitate Na+/K+-ATPase α1 subunits expressed in HEK293 cells. These results are in agreement with the findings from the brain tissues except that myoVa could not co-immunoprecipitate Na+/K+-ATPase α1 subunits expressed in HEK293 cells. Reciprocally, we also wanted to determine whether the immunoprecipitation of Na+/K+-ATPase α1 subunits from adult rat brain tissues would lead to the co-immunoprecipitation of any of the myosins targeted in this study (Fig. 1b). 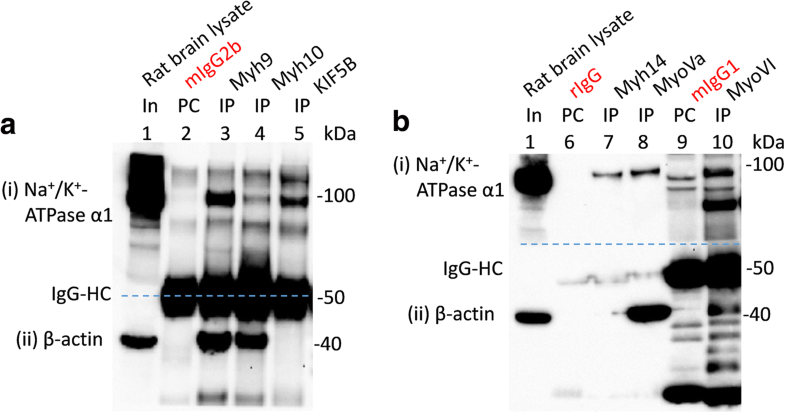 Results indicated that Na+/K+-ATPase α1 subunits expressed in the rat brain could co-immunoprecipitate myh9, myh10 and myoVa but not myoVI (Fig. 2). We also observed that IP of Na+/K+-ATPase α1 subunits led to the co-IP of MRLCs expressed in rat brain tissues (Fig. 2; panel (iv)). MRLCs are associated with NMHC-IIs and other myosins (smooth muscle myosin/Myh11, myosin 15/Myo15, myosin 18A/Myo18A, myosin 19/Myo19) expressed in the nervous tissues [25–27]. 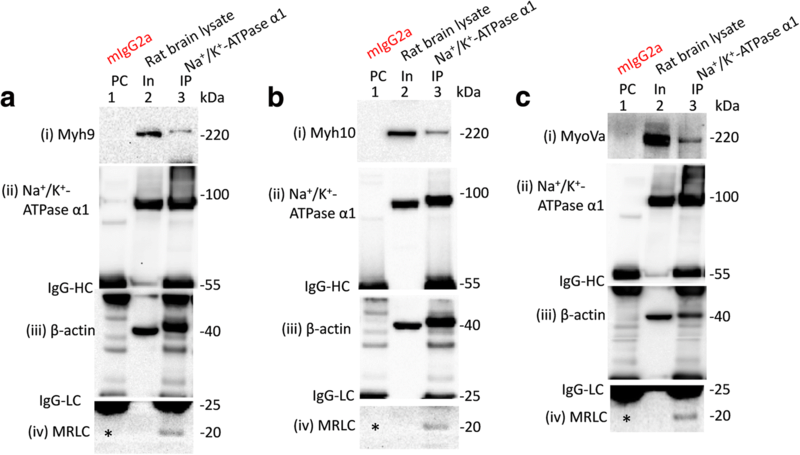 It is possible that co-IP of MRLCs with Na+/K+-ATPase α1 subunits is as a result of Na+/K+-ATPase α1 subunits pulling down class NMHC-IIs and other myosins expressed in rat brain tissues. Alternatively, it is plausible that Na+/K+-ATPase α1 subunits might be interacting with MRLCs directly or indirectly via other proteins. Similarly, we wanted to know whether the immunoprecipitation of Na+/K+-ATPase α1 subunits from HEK293 cells would lead to the co-immunoprecipitation of any of the myosins targeted in this study (Additional file 11: Figure S10). To our surprise, Na+/K+-ATPase α1 subunits could not co-immunoprecipitate myh9, myh10, myoVa or myoVI expressed in HEK293 cells though anti-Na+/K+-ATPase α1 antibodies immunoprecipitated Na+/K+-ATPase α1 subunits and co-immunoprecipitated β-actin from HEK293 cells (not all data are shown; Additional file 11: Figure S10). Based on our earlier findings we investigated whether myh9, myh10 or myoVI would co-immunoprecipitate recombinant Na+/K+-ATPase α1 subunits expressed in HEK293 cells. 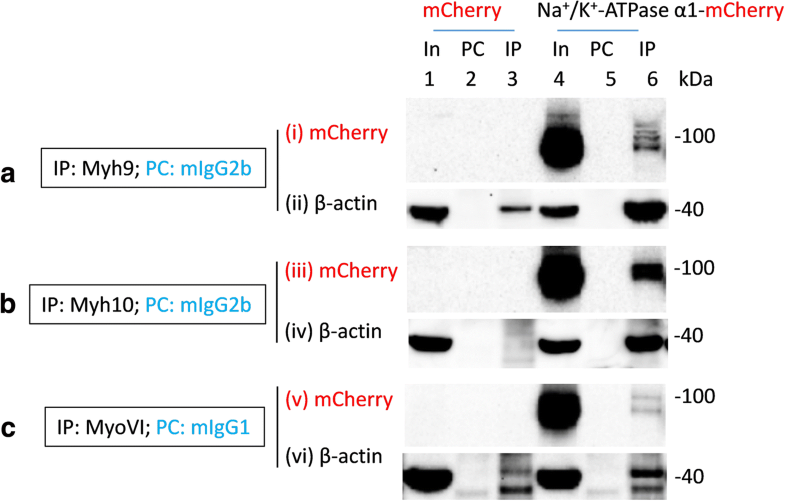 To this end, we overexpressed mCherry (as a control) and Na+/K+-ATPase α1 subunits tagged with mCherry in their C-terminus (i.e., Na+/K+-ATPase α1-mCherry) in HEK293 cells (Fig. 5, Additional file 12: Figure S11, Additional file 13: Figure S12 and Additional file 14: Figure S13). Both myh9 and myh10 co-immunoprecipitated recombinant Na+/K+-ATPase α1 subunits (i.e., Na+/K+-ATPase α1-mCherry), but not mCherry, expressed in HEK293 cells. Similarly, myoVI also co-immunoprecipitated Na+/K+-ATPase α1-mCherry, but not mCherry, expressed in HEK293 cells (Fig. 5c ). The co-immunoprecipitation signals for Na+/K+-ATPase α1-mCherry subunits by myh9, myh10 or myoVI revealed multiple mCherry immunoreactive bands which could be, among others, as a result of overexpression, degradation, propeptide cleavage and post-translational modifications of recombinant Na+/K+-ATPase α1 subunits expressed in HEK293 cells . We also observed significant co-immunoprecipitation of β-actin by myh10 and myoVI (lane 6, panel (vi), Fig. 5c) only in the presence of heterologously expressed Na+/K+-ATPase α1 subunits in HEK293 cells. This was surprising as myh10 and myoVI antibodies poorly co-immunoprecipitate β-actin from HEK293 cells. Hence, the β-actin co-immunoprecipitation seen in lane 6 of panels (iv) and (vi) (Fig. 5c) appears to be as a result of overexpression of Na+/K+-ATPase α1 subunits. We also determined whether recombinant myosins would co-immunoprecipitate Na+/K+-ATPase α1 subunits expressed in HEK293 cells. To this end, we overexpressed GFP (as a control), GFP-myh9 and GFP-myh10 (GFP tag in their N-terminus) in HEK293 cells (Additional file 3: Figure. S2). Results indicated a lack of or very poor co-immunoprecipitation of endogenous Na+/K+-ATPase α1 subunits as a result of immunoprecipitation of GFP-myh9 or GFP-myh10 heterologously expressed in HEK293 cells (Additional file 3: Figure S2). As expected GFP-myh9, not GFP, co-immunoprecipitated β-actin expressed in HEK293 cells. However, immunoprecipitation of GFP-myh10 using mouse anti-GFP antibodies did not lead to co-immunoprecipitation of β-actin expressed in HEK293 cells. Use of a pan-Na+/K+-ATPase α subunit antibody (Santa Cruz Biotechnology: sc-58,628/clone M7-PB-E9) for immunoblotting did not alter the outcome seen with the use of anti-Na+/K+-ATPase α1 subunit antibodies (DSHB) (Additional file 3: Figure S2B). 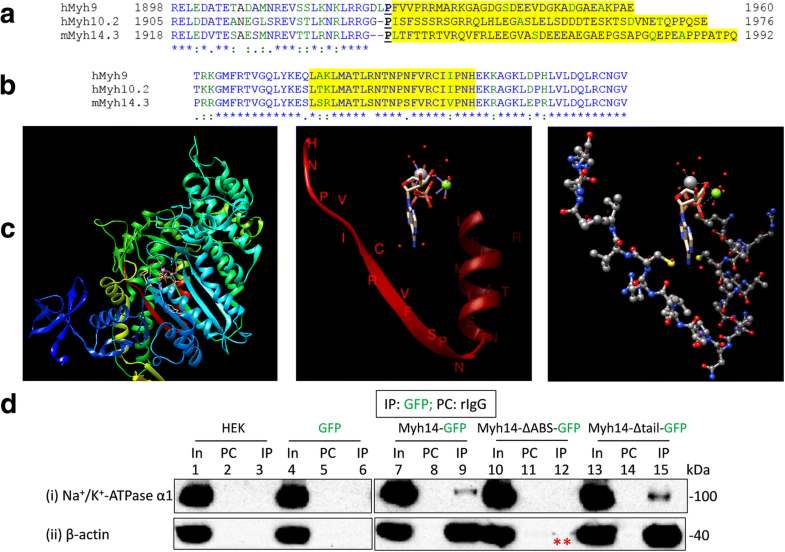 We reasoned the fusion of the GFP tag in the N-terminus of myh9 and myh10 could be partly responsible for this outcome. Next, we immunoprecipitated myh9, myh10 or myh14 tagged with GFP in the C-terminus (i.e., myh9-GFP, myh10-GFP or myh14-GFP respectively) using anti-GFP antibodies of mouse, rabbit and/or goat origin to investigate whether these recombinant myosins, not GFP, upon heterologous expression would co-immunoprecipitate Na+/K+-ATPase α1 subunits expressed in HEK293 cells (Figs. 6, 7 and Additional file 4: Figure S3, Additional file 5: Figure S4, Additional file 6: Figure S5 and Additional file 7: Figure S6). Immunoprecipitation of myh9-GFP or myh14-GFP using the same mouse anti-GFP antibodies led to the co-immunoprecipitation of Na+/K+-ATPase α1 subunits and β-actin (Additional file 4: Figure S3). However, immunoprecipitation of myh9-GFP (Fig. 6b and Additional file 5: Figure S4), myh10-GFP (Additional file 6: Figure S5) and myh14-GFP (Fig. 7 and Additional file 7: Figure S6) using goat anti-GFP antibodies or rabbit anti-GFP antibodies led to a much cleaner co-immunoprecipitation of Na+/K+-ATPase α1 subunits expressed in HEK293 cells. We employed an approach similar to the one described above to study the interaction of recombinant myoVI with Na+/K+-ATPase α1 subunits expressed in HEK293 cells. Hence, we tagged myoVI with GFP in the C-terminus (i.e., myoVI-GFP) and expressed them in HEK293 cells (Additional file 9: Figure S8). Surprisingly, immunoprecipitation of recombinant myoVI using rabbit or goat anti-GFP antibodies did not lead to the co-immunoprecipitation of Na+/K+-ATPase α1 subunits expressed in HEK293 cells (Additional file 9: Figure S8). 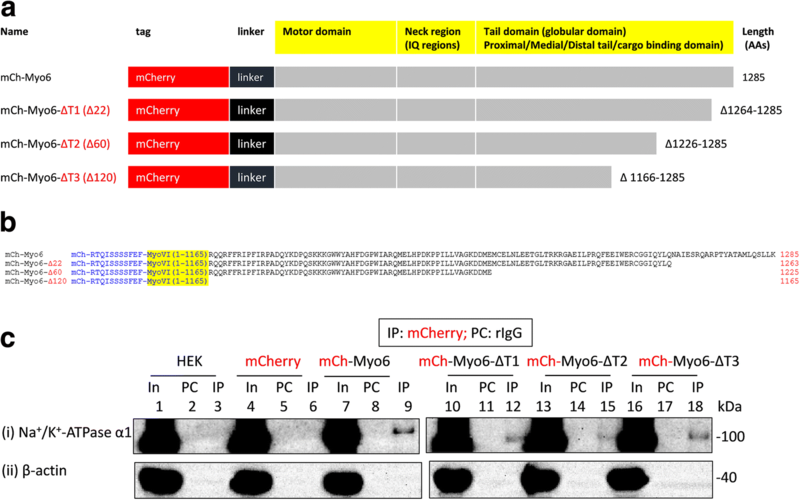 As a recourse, we tagged myoVI with mCherry in the N-terminus (i.e., mCherry-myoVI) and expressed them in HEK293 cells. mCherry-myoVI, but not mCherry, immunoprecipitation led to the co-immunoprecipitation of Na+/K+-ATPase α1 subunits expressed in HEK293 cells (Fig. 8). Myosins employ various adaptor proteins to transport their cargoes (i.e., myosin-adaptor-cargo) [29, 30]. The adaptor proteins typically interact with the tail regions of various myosins. Hence myosins possess cargo binding domains (CBD) in their tail regions. Therefore, we wanted to know whether the tail regions of NMHC-IIs (i.e., myh9, myh10, myh14) and myoVI are involved in their interaction with Na+/K+-ATPase α1 subunits. We deleted the tail regions of NMHC-IIs (i.e., 33, 43 and 47 AAs from their C-terminal ends in myh9, myh10 and myh14 respectively) to make myh9-Δtail-GFP, myh10-Δtail-GFP or myh14-Δtail-GFP (Fig. 7a). Then we overexpressed and immunoprecipitated tail-less (Δtail) recombinant NMHC-IIs (i.e., myh9-Δtail-GFP, myh10-Δtail-GFP or myh14-Δtail-GFP) and probed for their ability to interact with Na+/K+-ATPase α1 subunits expressed in HEK293 cells. Tail-less myh9 (i.e., myh9-Δtail-GFP), myh10 (i.e., myh10-Δtail-GFP) or myh14 (i.e., myh14-Δtail-GFP) were able to co-immunoprecipitate Na+/K+-ATPase α1 subunits expressed in HEK293 cells (Fig. 7d and Additional file 5: Figure S4, Additional file 6: Figure S5 and Additional file 7: Figure S6). These results indicated that regions other than the tail ends are probably involved in the interaction of NMHC-IIs with Na+/K+-ATPase α1 subunits expressed in HEK293 cells. Next, we wanted to know whether tail-less (ΔT) myoVI would interact with Na+/K+-ATPase α1 subunits expressed in HEK293 cells (Fig. 8). The C-terminal end (or tail region) of myoVI possesses many sites for interaction with various adaptor proteins and/or cargoes [29, 30]. Hence, first we made and expressed a recombinant myoVI that lacked 22 AAs (i.e., i.e., mCherry-Myo6-ΔT1) from its C-terminal end and examined its ability to interact with Na+/K+-ATPase α1 subunits expressed in HEK293 cells (Fig. 8). Immunoprecipitation of mCherry-myoVI-ΔT1, but not mCherry, led to the co-immunoprecipitation of Na+/K+-ATPase α1 subunits expressed in HEK293 cells (Fig. 8c). Then we made two additional myoVI deletion constructs which lacked either 60 AAs (i.e., mCherry-Myo6-ΔT2) or 120 AAs (i.e., mCherry-Myo6-ΔT3) from their C-terminal ends. Like mCherry-Myo6-ΔT1, both mCherry-Myo6-ΔT2 and mCherry-Myo6-ΔT3 co-immunoprecipitated Na+/K+-ATPase α1 subunits expressed in HEK293 cells (Fig. 8c). Hence, tail-less myo6, like those of tail-less NMHC-IIs, interact with Na+/K+-ATPase α1 subunits and regions aside their tail regions appear to be involved in the interaction of myoVI with Na+/K+-ATPase α1 subunits. Previous results indicated that tail-less NMHC-IIs interact with Na+/K+-ATPase α1 subunits. These results indicated that region(s) other than the C-terminal tail ends in NMHC-IIs is/are important for their interaction with Na+/K+-ATPase α1 subunits. Hence a non-tail region such as motor domain (site for ATP and actin binding), neck region (the site for light chain binding) or a conserved AA motif in these domains could be involved in the interaction of NMHC-IIs with Na+/K+-ATPase α1 subunits. This is plausible as the tails are divergent and a common or conserved mechanism appear to be involved in the interaction of NMHC-IIs with Na+/K+-ATPase α1 subunits. Additionally, we knew (and observed) that Na+/K+-ATPase α1 subunits co-immunoprecipitate β-actin  and NMHC-IIs (i.e., myh9, myh10 or myh14), native or recombinant, also co-immunoprecipitate β-actin. Hence, we wanted to determine whether the conserved actin binding site (ABS) of NMHC-IIs (Fig. 7b) are important in their interaction with Na+/K+-ATPase α1 subunits. To this end, we made and expressed recombinant myh9, myh10 or myh14 lacking 22 AAs (involved in actin binding) from their motor head regions (i.e., myh9-ΔABS-GFP, myh10-ΔABS-GFP and myh14-ΔABS-GFP) in HEK293 cells (Fig. 7b and Additional file 5: Figure S4, Additional file 6: Figure S5 and Additional file 7: Figure S6) [18, 19]. Immunoprecipitation of myh9-ΔABS-GFP (Additional file 5: Figure S4), myh10-ΔABS-GFP (Additional file 6: Figure S5) or myh14-ΔABS-GFP (Fig. 7d and Additional file 7: Figure S6) led to reduced or complete lack of co-IP of Na+/K+-ATPase α1 subunits from HEK293 cells. As expected, β-actin co-IP was drastically reduced or eliminated from these ABS-less recombinant NMHC-IIs. Hence it appears that the ABS in NMHC-IIs is involved in the interaction of NMHC-IIs with Na+/K+-ATPase α1 subunits. Class II myosins, traditionally known as conventional myosins, are expressed in striated muscles (i.e., myh1, myh2, myh3, myh4; etc. ), cardiac muscles (i.e., myh6, myh7, and myh7B), smooth muscles (myh11) and non-muscles (i.e., myh9, myh10, and myh14) . The non-muscle myosin II heavy chains (NMHC-IIs) (i.e., three of them: NMHC-IIA/myh9, NMHC-IIB/myh10, and NMHC-IIC/myh14) are widely expressed, as their name suggests, in non-muscle cells including neurons, microglia, podocytes; etc. [32–35]. They are also expressed in cardiomyocytes and at low levels in muscle cells [32, 34]. In this work we show that all the three NMHC-IIs (i.e., myh9, myh10 and myh14) interact with Na+/K+-ATPase α1 subunits expressed in the rodent brain and HEK293 cells (Table 1). These results may not be surprising as NMHC-IIs are homologous protein molecules possibly possessing similar structural and functional features for their interaction with Na+/K+-ATPase α1 subunits although they are engaged in unique biological functions at distinct cellular locations [36–40]. The interaction of NMHC-IIs with Na+/K+-ATPase α1 subunits are consistent with previous findings that NMHC-IIs interact with various proteins such as C-X-C chemokine receptor type 4 (CXCR4) , collagen receptor DDR1 (discoidin domain receptor 1) , Ins (1,4,5)P3 receptor , epidermal growth factor receptor (EGFR) , N-Methyl-d-aspartate (NMDA) receptors , α-amino-3-hydroxy-5-methyl-4-isoxazolepropionic acid (AMPA) receptor , the pore-forming subunit of P/Q-type calcium channels (Cav2.1) , battenin/juvenile Batten disease protein (Cln3: a lysosomal membrane protein) ; etc. A recent report implicates non-muscle myosin II (NM-II) in the sorting and post-Golgi dendritic trafficking of Kv2.1 channels . Hence our results possibly indicate that NMHC-IIs could be involved in the trafficking of Na+/K+-ATPase α1 subunits. These results are also suggesting that other class II myosins (such as myh1, myh3, myh6, myh7, myh14; etc. ), which are similar to NMHC-IIs in their structural configurations, could be involved in the transport and/or trafficking of Na+/K+-ATPase α1 subunits in cells (such as cardiomyocytes, skeletal muscles, smooth muscles; etc.) where both molecules are expressed. Positive interaction of NMHC-IIs with Na+/K+-ATPase α1 subunits prompted us to investigate whether non-class II myosins (i.e., unconventional myosins) would interact with Na+/K+-ATPase α1 subunits. Myosin Va (myoVa) immediately caught our attention. In alveolar epithelial cells it is involved in restraining Na+/K+-ATPase-containing vesicles within intracellular pools and overexpression of dominant-negative myoVa or knockdown with specific shRNA increased the average speed and distance traveled by the Na+/K+-ATPase-containing vesicles . These results suggested that myoVa might be interacting with Na+/K+-ATPase α1 subunits expressed in alveolar epithelial cells. 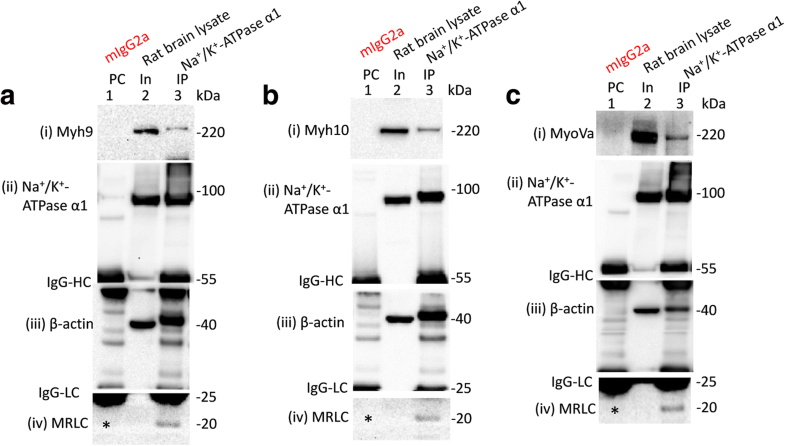 Our data indicate that myoVa interact with Na+/K+-ATPase α1 subunits expressed in the brain tissues (Figs. 1 and 2, Table 1) but not in HEK293 cells. This is possibly an indication that myoVa interact with Na+/K+-ATPase α1 subunits in a tissue specific manner and one or more molecular components required for their interaction in native tissues might not be present in HEK293 cells. Nonetheless our results are consistent with earlier observation that myoVa is involved in the trafficking of membrane proteins such as AMPA receptors; glucose transporter type 4 (GLUT-4); etc. [9, 50, 51]. These results also suggest that myoVa might be involved in the anterograde trafficking of Na+/K+-ATPase α1 subunits because of its known role in such processes [9, 51–56]. Our results also indicated that myoVI, another unconventional myosin, interact with Na+/K+-ATPase α1 subunits (Table 1). It is consistent with previous reports that myoVI interact or associate with various proteins and is involved in their transport and trafficking [9, 20, 57–60]. For example, myoVI is implicated in the trafficking and sorting of a transmembrane receptor (PlexinD1), transporter (GLUT1), cotransporters (NaPi2a and NaPi2c), transmembrane conductance regulator (CFTR); etc. . 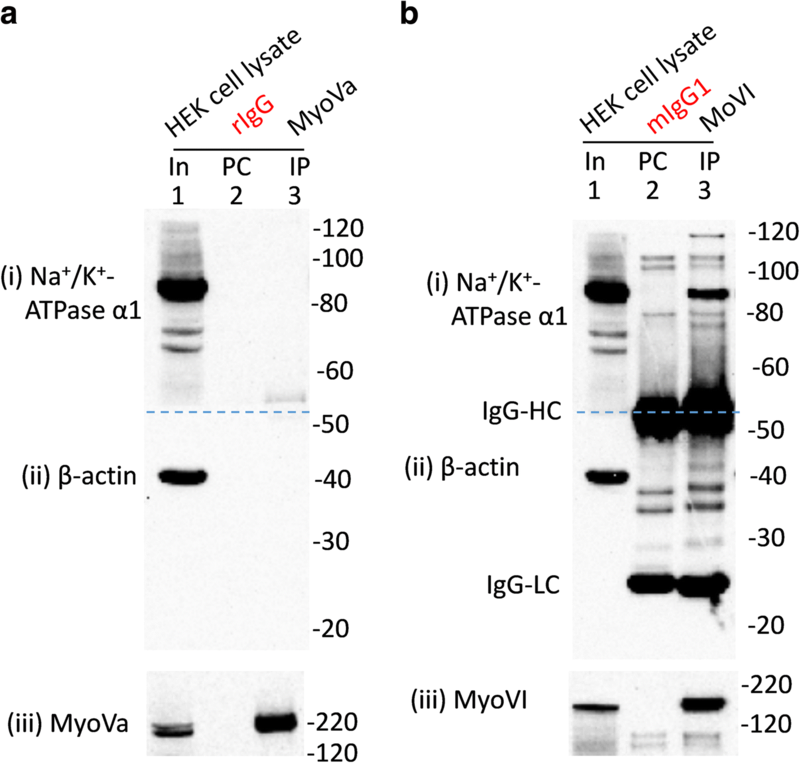 It is possible that myoVI might be involved in the retrograde trafficking of Na+/K+-ATPase α1 subunits because of its known role in endocytosis, autophagy and trafficking of ubiquitinated cargoes [57, 58]. We observed that Na+/K+-ATPase α1 subunits interact with the myosin regulatory light chains (MRLCs; also known as regulatory light chain 20 (RLC20)). This is consistent with previous observations that myosin light chains are important for interaction of NMHC-IIs with their partner proteins. Both the heavy and light chains of NMHC-IIB interact with the cytoplasmic C-terminal region of the Ca(v)2.1 subunit of P/Q-type calcium channels . Similarly, the interaction of NMHC-IIs and EGFR requires the regulatory light chain 20 (RLC20) of NMHC-IIs . These results indicate that the neck region, the site for MRC or RLC20 binding, of NMHC-IIs could be important for their interaction with partner proteins including Na+/K+-ATPase α1 subunits. As a whole the observations that Na+/K+-ATPase α1 subunits interact with multiple myosins and MRLCs are consistent with earlier observations that they interact and/or co-localize with various proteins including atypical sodium channel (Nax: SCN7A, SCN6A), water channel aquaporin 4 (AQP4), ionotropic glutamatergic AMPA receptors (AMPARs), glutamate transporter (GLAST and GLT-1), glycine transporter (GlyT2), STIM1(stromal interaction molecule 1)-POST (partner of STIM1) complex, follistatin-like 1 (FSTL1), Polycystin-1 (PC-1); etc. [61–69]. We observed that tail-less NMHC-IIs and myoVI interact with Na+/K+-ATPase α1 subunits. These results indicated that region(s) other than the C-terminal tail ends in NMHC-IIs is/are important for their interaction with Na+/K+-ATPase α1 subunits. Hence a non-tail region such as motor domain, neck region or a conserved AA motif in these domains could be involved in the interaction of NMHC-IIs with Na+/K+-ATPase α1 subunits. Consistent with these ideas we show that NMHC-IIs lacking their actin binding sites, which are conserved in myosins, show reduced or null interaction with Na+/K+-ATPase α1 subunits. Hence, actin binding sites of NMHC-IIs are possibly involved in their interaction with Na+/K+-ATPase α1 subunits. These results also indicate that actin might be involved in the interaction of NMHC-IIs with Na+/K+-ATPase α1 subunits. Moreover, both NMHC-IIs and Na+/K+-ATPase α1 subunits directly interact with actin. Therefore, it is plausible that a tripartite interaction of Na+/K+-ATPase, β-actin and myosin could be occurring where (monomeric or polymeric) actin might serve as a link between Na+/K+-ATPase α1 subunits and myosin (i.e., Na+/K+-ATPase::actin:myosin complex). Alternatively, it is possible that myosins (such as myh9, myh10, myh14, myoVa and myoVI) are interacting with Na+/K+-ATPase α1 subunits using adaptor or partner proteins. This idea of a myosin-adaptor- Na+/K+-ATPase complex may not be farfetched as Na+/K+-ATPase α1 subunits contain multiple structural motifs that enable them to interact with various soluble, membrane and structural proteins such as ankyrins, BiP, calnexin, cofilin, adducin, actin; etc. [2, 3, 70–73]. It appears that NMHC-IIs could be using a common set of adaptors for their interaction with Na+/K+-ATPase α1 subunits though alternative use of unique adaptors can’t be discounted. In this work we provide evidence that actins and myosins interact with Na+/K+-ATPase α1 subunits. The actin-myosin network is involved in short range trafficking whereas the microtubule-kinesin network is involved in long range cellular trafficking . Moreover, in neurons microtubules extend along the full length of the axon and transect actins both in the soma and axon. Hence it appears that kinesins could play a role in concert with myosins to localize Na+/K+-ATPase α1 subunits (sodium pump) to far off places from the cell body. Overall, our data support a model in which the actin-myosin network is involved in the trafficking of sodium pumps in neuronal and non-neuronal tissues. We thank Fadia Dib-Hajj and Palak Shah for molecular biology support. We also thank Shujun Liu, Peng Zhao and Lawrence J Macala for animal tissue collection. The Center for Neuroscience and Regeneration Research is a Collaboration of the Paralyzed Veterans of America with Yale University. This material is the result of work supported with resources and the use of facilities at VA Medical Center, West Haven, CT. Portions of this work has been presented in abstract form: B. Dash, C. Han, E. J. Akin, S. D. Dib-Hajj, S. G. Waxman (2017). Myosins interact with voltage gated sodium channels, sodium calcium exchangers and sodium potassium ATPases. Soc. Neurosci. Abst. 288.11/D32. This work was supported in part by grants from the Rehabilitation Research Service and Medical Research Service, Department of Veterans Affairs (to S.D.D.-H. and S.G.W.). The article contains all the relevant data. BD, SDH and SGW conceived the idea for the project, designed the experiments and wrote the manuscript. BD conducted the experiments, analyzed the results, and wrote the first draft of the paper. All authors read and approved the final manuscript. All animal care and experimental studies were approved by the Veterans Administration Connecticut Healthcare System Institutional Animal Care and Use Committee.